The Forum brings together religious leaders, politicians and thinkers to address global challenges.  Negative and lack of awareness to the need for religious harmony and ethnic diversity threatens the universal status of citizenship.  Indicative charters are mere guides that require effective practical programs. The Secretary General of the Muslim World League Sheikh Dr. Mohammad Bin Abdulkarim Alissa stressed that today's world is in need of generations steeped in an educational system that teaches them how to think, promote respect, accepting others, and instill in them that true belief in difference and diversity are human nature. 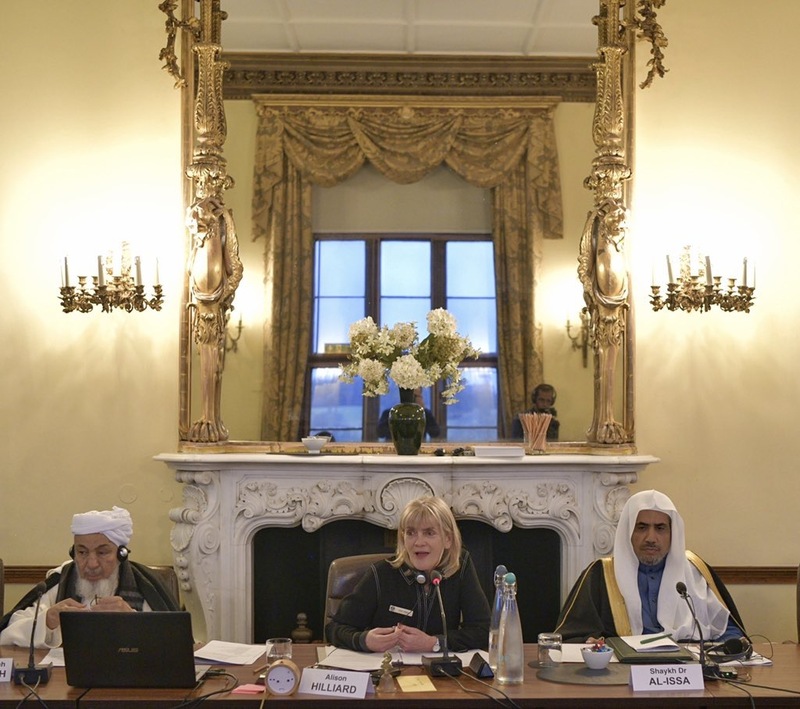 These remarks came in a speech of His Excellency in front of a number of religious, political and intellectual figures who discussed – over three days period - the issues of "promoting inclusive citizenship"; within an extended dialogue at the "Wilton Park" and supported by the British government. The opening session of the forum witnessed the key speech of the Secretary General of the Muslim World League, which he began by praising the meeting’s pivotal aspect that discussed important issues relevant to the topic of promoting inclusive citizenship in order to find a national environment that will ensure the existence of all cultural connotations of the national state. Dr. Alissa also explained: Allah created people different and dissimilar; had the Almighty wanted to make them one nation, there will be negative differences between them that won’t be overcome except by only a group among them that God has imbued with consciousness. The latter realized the wisdom of the Creator in difference and diversity, pointing out that the verse indicates that God created people for that particular diversity. This invites us to ponder on the divine rule, the trial and then the punishment in the Hereafter. Additionally, if they were not like that, human would have been another automated creature like the angels programmed and molded by God's command in a single form. Dr. Alissa also addressed the challenges facing inclusive citizenship, foremost of which is poor awareness arising from negative family and educational environment; add to that and the harmful nature of the general culture boosted by religious narratives. Not to forget political, legislative and civil society institutions and the level of available fair values within the vision, mission and objectives of each country, in addition to the family and educational aspects. In the course of his speech, Alissa asked what he termed as the basic and most realistic question on the subject of inclusive citizenship, saying, if inclusive citizenship is essential for every society and requires only a decision that doesn’t cost much, why haven’t we achieved it in our world today as much as we aspire to. Were those who have tried, all along, to incapacitate its achievement aware of their grave error according to the logic of the moral theory which will lead to the correct result? If they knew this mistake, why have they insisted on it while they were looking for their sustainable interest, and have no interest in the wrong way; why then have they deliberately and insistently followed this course? His Excellency added that the answer to this is threefold. First: The dominance of hasty self-interest, whether it is on the individual or collective level at the account of the principle of justice and values. It is undoubtedly a deficient view because it will incur losses at the end. Second: It is the conviction of some that "utilitarian" pragmatism, no matter how idealists "utopian," have undermined it, does in their view, represent the ideal value so long as the outcome will lead to the supremacy of the nation, religion, thought or doctrine they support. As for the third point, political and religious backwardness and corruption, in addition to the dissemination of the message through propaganda and religious stimuli targeting emotions, not logic, simply because it has no inkling of the truth. This complicates the problem further that these messages which will reach the receiver inject the latter with the conviction that they speak in the name of the Lord. Again, this fallacy creates, with the passage of time a general culture and predominant societal norms due to the invasion of ideas and conquest of the insensible awareness as a result of that recruitment. After all this, the reasonable question would be: Is it useful to pen a charter with striking words and embellished meanings to this effect, the way this gathering strives to achieve, yet lacking effective influence? Emphasizing that the problem of inclusive citizenship in many parts of our world lies in the reasons that goes from the easy to the complex, which necessitates diagnoses and treatment in its roots and to look for how this treatment could be carried out. In addition to recalling ideal global models in this regard, and to recognize the secret of their success and excellence in the experience of inclusive citizenship, and the positive integration within their religious and ethnic diversity. The Secretary General sees that the most important aspects of inclusive citizenship are related to the bases of the general culture mentioned earlier on. All of these require practical and effective programs compatible and suitable to the conditions of each community. How much our world needs educational methods that teach generations how to think and discern, and educate them to respect and accept others? A program that will strengthen the true faith, that difference and diversity are universal nature to human beings. This must be followed by the fine art of dealing with others in order to preserve their dignity, and ensures the exemplary way of how to coexist and cooperate with them. His Excellency continued saying, it is from here we welcome human harmony or human family that will transcend the mere meaning of fraternal brotherhood, which is a divine destiny. After all, man is the bother of man whether he likes it or not. How wonderful that this harmony will encompass all, not only to be launched "spiritually" or through the Abrahamic faith only. We must avoid falling into the general trap of human classification and exclusion. The spiritualists must set their own framework regarding brotherhood, harmony or the faith family. For example, the Abrahamic sphere of the Human Harmony Project presents a restriction that excludes half of the Earth's population. However, special groups, whether Abrahamic or other, can cooperate with each other for any work that would be fruitful and beneficial to them or to the entire humanity without carrying any message or hint of exclusion towards others in the issue related to coexistence and human peace in “general”. Alissa reiterated the need to the importance of moral foundation in matters related to respecting others and the practical affirmation of their right to exist and dignity with all the guarantees and requirements. His Excellency is looking forward to a renewed meeting at its next event that will submit pivotal points that will vigorously enhance its framework charter through presenting practical programs on the basis of considering inclusive citizenship to be a prerequisite to the peace and harmony of societies that is casting its shadow over the peace and harmony of the entire world.